The ideology that unites Trump and the authoritarians Trump admires is all about propping up 'besieged majorities' in multiethnic countries. 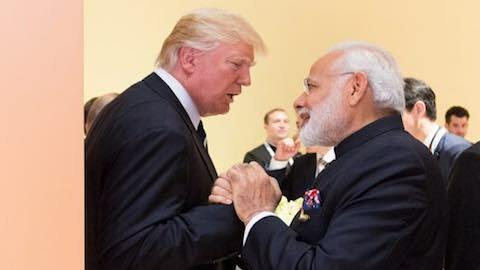 Donald Trump is popular in India -- where only 17 percent of the population considers the president “intolerant,” compared to a global average of 65 percent -- and he has warmly welcomed Indian Prime Minister Narendra Modi to the White House. Both leaders are eager to bump up bilateral security cooperation to the next level. Even Donald Trump, Jr. is getting in on the act. He's visiting India this week as part of the Trump organization's myriad economic connections to the subcontinent. Indians, treating the president's son as a representative of the White House, are paying a lot of rupees to gain access to his ear. Who can blame them? It's virtually impossible to disaggregate the different components of the Trump megaplex. But there's another, underlying similarity. Trump is borrowing a page from Modi's book on how to advance majoritarian politics in a multiethnic country. This kind of majoritarianism is most prominently on display these days in Myanmar -- where the government considers the Rohingya minority to be foreigners, not citizens at all, and thus has no problem expelling them (or, in some cases, killing them). Majoritarianism has also been a major feature of political life in Pakistan, Bangladesh, and Sri Lanka. In India, meanwhile, Modi heads a right-wing nationalist party that believes that the country is essentially Hindu with no particular obligation to guarantee minority rights. Indeed, several disturbing examples of mob rule have taken place during Modi's tenure, and the government has both explicitly and through various dog whistles appealed to Hindus over (and against) Muslims. As Kesavan points out, majoritarianism is not simply Islamophobia -- in India or Myanmar or anywhere else. After the victories of the civil rights movement and other social movements, some white people have acquired the mentality of a besieged majority: They fear that they will lose their remaining privileges, like members of an elite frequent flyer program forced to sit back in economy class. Perhaps only a minority of white people -- mostly white men -- feel like a besieged majority. But for the next decade or so, before demographics decisively downgrade white status, this group will continue to flex its political muscle. Trump's appeals to this group follow in a sordid American tradition of racist and anti-immigrant movements such as the Know-Nothings and the Ku Klux Klan. The conflicts that swept through the United States in the 19th and early 20th century resembled, avant la lettre, the communal strife that accompanied the consolidation of modern nations in South Asia. America narrowly avoided partition in the 1860s, but not the “lynchings, pogroms, and ethnic cleansing” of majoritarian politics that followed. Even the mass population transfers that took place between India and Pakistan could be detected in the Great Migration of African Africans to the North beginning in the Jim Crow period. Today, Trump has cleverly given the “besieged majority” a platform on immigration, economic policy, and the “history” question. On the economy, Trump promised to revive sunset industries that have traditionally been white bastions, such as coal in Appalachia and manufacturing in the Midwest. On history, Trump has argued that by removing the statues of Confederate heroes, “they're trying to take away our culture.” The “our” is a telling touch, since it could refer equally to the U.S. or to white people. The immigration question in particular continues to bedevil the administration and Congress. To get a deal that would allow the Dreamers -- young people brought to the United States as children who remain undocumented -- liberals have even been willing to approve funding for Trump's famous wall along the border with Mexico. Basically, the Democratic Party was poised to pay a ransom of almost $14,000 a head to save the Dreamers (that's $25 billion for the wall in exchange for 1.8 million Dreamers staying in the United States). Trump, however, said no, despite all sorts of assurances that he cares very deeply about the Dreamers. You'd think that the president would be concerned about the public opinion polls that show a large majority of Americans -- around 70 percent -- in favor of the Deferred Action for Childhood Arrivals (DACA) program. But that's the problem with a president who has such low favorability ratings. He doesn't need to compromise to maintain his base of support because that base is so narrow in the first place. Only 18 percent of Americans support Trump unconditionally, according to a recent CBS poll, and another 23 percent do so only when he delivers what they want. The last line contains the kicker -- the population transfer that Trump yearns to orchestrate. In addition to deporting the Dreamers, the undocumented, and those with temporary protected status like Salvadorans and Haitians, Trump wants to keep out as many folks from “shithole” countries as he can. If he gets his way, the administration is looking to “transfer” several million people out of the country, nearly comparable to the population transfer out of India at the time of partition in 1947. Going the other way in Trump's dream world would be a trickle of Norwegians and other racially acceptable immigrants. Benjamin Netanyahu has driven Israel into a corner by rejecting Palestinian (and international) demands for a two-state solution. The Jewish majority is fast on its way to becoming a minority within Israel. Once constituting 87 percent of the population in 1950, Jews are now close to parity with Arabs if you count everyone in the Occupied Territories and Gaza (6.1 million Jews and 5.8 million Arabs). Yet Netanyahu continues to advocate on behalf of the “besieged majority” by supporting illegal settlements, rejoicing in the Trump administration's recognition of Jerusalem as the capital of Israel, and kowtowing to the country's religious right. Saudi Arabia, a Sunni majority country, is also home to a large Shiite minority of about 10 percent of the population. Riyadh has systematically discriminated against this minority -- in part because of fears of its links to Iran. The Saudi government has imprisoned and executed leading members of the community and has even effectively waged war against Shi'ites in the city of Awamiya. I've chosen these three countries because Donald Trump has formed strong bonds with Putin, Netanyahu, and Saudi Crown Prince Mohammed bin Salman. But there's no shortage of other leaders that fall into this category -- Rodrigo Duterte in the Philippines, Viktor Orban in Hungary, Recep Tayyip Erdogan in Turkey. They all aspire to follow the South Asian example. Majoritarianism has morphed into one of the 21st century's greatest threats. The “tyranny of the majority” that America's founding fathers warned about has become a reality thanks to the failure of left liberalism to sell multiculturalism more effectively. Majoritarianism has evolved into a knee-jerk response to what globalization offers, for better or worse -- from increased trade and greater flows of immigrants and refugees to the freer exchange of information behind both rapid technological transformation and the demands of transnational human rights movements. Nationalism, a disguise that the majority dons to make their demands somehow more palatable, is a bunker that a country can crawl into to survive the high winds of change. Combatting majoritarianism requires a new campaign and new institutions. That's my dream: a world that recognizes that multiculturalism isn't just cool but essential to democratic politics, strong economies, and healthy societies that don't tear themselves apart from the inside. World News: "The Ideology That Unites Authoritarians "